Over the years, there have been many names for plantar plate tears, including crossover toe deformity, hammertoe, metatarsalgia, predislocation syndrome and metatarsophalangeal joint (MPJ) instability. This is mainly due to the lack of understanding and appropriate workup of this common problem. The main cause of the problem seems to be an abnormally high level of pressure on the associated MPJ region, resulting in strain and subsequent tear to the plantar plate region. This results in instability and pain in the associated joint. There is a higher incidence of plantar plate tears for females in comparison to males at a 10:1 ratio. In females, plantar plate deformity progression may tend to parallel the progression of bunions and/or the use of high heeled shoes, which place higher peak pressure loads on the forefoot region. Senior patients tend to have longstanding pain and deformity, resulting in chronic overload syndrome and deterioration of the plantar plate. Younger patients tend to be athletic and relate a traumatic event resulting in a pop or snap of their toe. Regardless of age, it is a common deformity that is becoming better understood but is still commonly misdiagnosed and often poorly treated. In order to better understand and treat plantar plate injuries, it is important to know the anatomy of the region. The plantar plate is a fibrocartilaginous structure made of type 1 collagen, which makes for a very strong construct for daily wear and tear of ligaments. Proximally, it is an extension of the plantar aponeurosis with its distal attachment to the base of the proximal phalanx, thus providing static stability of the toe. The distal most portion is the thickest aspect of the plantar plate. Medial and lateral to the plantar plate are the collateral ligaments. There are two distinct types of collateral ligaments: proper and accessory. The proper collateral ligaments originate from the dorsal/superior aspect of the metatarsal tubercle and insert to the proximal plantar base of the proximal phalanx. The accessory collateral ligaments originate from the inferior aspect of the metatarsal tubercle and insert to the lateral aspect of the plantar plate. These ligaments work in conjunction with the deep transverse intermetatarsal ligament to provide transverse plane stability. Although there are no musculotendinous insertions, the inferior surface of the plantar plate houses the flexor tendons in a plantar medial groove of the metatarsal head. This provides dynamic stability of the toe in the sagittal plane. Frequently, plantar plate injury is a hard deformity to treat because patients present with a multitude of forefoot problems that cause and exacerbate the injury. Such problems include a hypermobile first ray with or without a hallux valgus deformity, elongated second metatarsal, short first metatarsal, equinus deformity or, rarely, acute trauma. Furthermore, there may often be subtle tingling of the toe due to inflammation of the capsular structures, resulting in pressure on the digital nerve, which can lead to a potential misdiagnosis of neuroma. All these deformities, independently or concomitantly, cause an increased peak pressure of the associated metatarsal resulting in inflammation and attenuation of the plantar plate. Due to its longest length and the lack of proper function of the first ray in many noted cases, the second metatarsophalangeal joint (MPJ) is most commonly affected. The lateral aspect of the plantar plate has a higher incidence of damage. This results in the initial deviation and medial pull of the flexor apparatus, causing the second toe to drift medially. Over time, an increased medial pull of the flexor apparatus damages the lateral collateral ligaments, producing further transverse plane deformity. Another deforming force is the increased dorsal pull of the extensor tendons due to lack of opposition of the plantar plate and flexor tendons. This contributes to the sagittal plane aspect of the deformity. Although hammertoe formation is present, the hammertoe reduces in most cases with appropriate plantar plate repair and often does not need additional surgical correction. A subtle test to see if a hammertoe will reduce prior to surgery is to tape the toe down with a dorsal to plantar strap. If the hammertoe reduces with strapping of the MPJ in anatomic position, the hammertoe will also reduce with plantar plate stabilization. Depending on the stage and duration of pain, patients will present with different clinical symptoms. The most common are inflammation and pain localized to the plantar aspect of the sulcus distal to the metatarsal head. Increased pain will also be present during the propulsion stage of the gait cycle. Patients will also often complain of pain with stress on the MPJ and a good indicator of a plantar plate rupture is a dorsal drawer test. A positive dorsal drawer test will generally elicit pain as well as dorsal puckering of the second MPJ. Other times, patients may complain of a burning, throbbing or tingling sensation of the joint, which physicians can misdiagnose as a neuroma, stress fracture, osteoarthritis, autoimmune arthritis or even Freiberg’s infraction. One can rule out most of these differential diagnoses with a proper history, physical exam, serologic studies and imaging. Weightbearing radiographs are the first-line modality to assess plantar plate injuries. A dorsal plantar view enables one to evaluate the transverse deviation of the second digit corresponding to the metatarsal. You can also check for bony abnormalities such as an elongated second metatarsal or hallux valgus deformity. A lateral view helps determine whether the joint is congruous, subluxed or dislocated. A lateral view will also show the level of elevation associated with the first ray in comparison to the lesser rays. An oblique view accentuates the position of the second digit to the metatarsal. Though radiographs are helpful, magnetic resonance imaging (MRI) can directly assess the quality of the plantar plate. The MRI will allow one to see any joint effusion, thickening and partial to complete plantar plate ruptures. Keep in mind that ruptures can be difficult to visualize. One helpful trick is measuring the thickness of the plantar plate on an MRI. Normal thickness is about 2-3 mm and pathologic thickness is at least 4-6 mm. An MRI is also a great modality to help differentiate other diagnoses as we mentioned above. Partial tears are far more common than complete tears. One must educate the radiologist on the underlying condition so there is an appropriate emphasis on the lateral plantar plate and lateral collateral structure on MRI examination. Further testing can occur with the use of diagnostic ultrasound. The benefit of high intensity focused ultrasound is the fact that it is a dynamic exam that allows you to check the toe while the toe is under stress. Measurement of the plantar plate is also possible on ultrasound and one can dynamically check the attachment to the plantar proximal phalanx. In rare cases, one can combine intra-articular dye injection with a radiograph to check the plantar plate. However, bear in mind that this is an older test and can result in false positives if the dye is too close to the plantar surface. It can also result in false negatives if there is scar formation in the tear area decreasing dye leakage. After ensuring proper diagnosis of a plantar plate injury, proceed with conservative treatment options. A simple strapping of the toe just distal to the second MPJ in a dorsal to plantar position will allow toe purchase and reduce stress to the plantar plate. This strapping is diagnostic and can reduce pain. Shoe modification and orthotics with a submetatarsal cutout can allow for offloading of the stressed area as well as stabilize other biomechanical etiologies. Consider physical therapy and oral steroids if the joint is inflamed. However, steroid injections are not recommended to decrease localized inflammation because they may further weaken or rupture the plantar plate. After exhausting conservative treatments, one should consider surgical intervention to treat plantar plate tears. The goals of surgery include stabilizing the MPJ and correcting the underlying biomechanical source that is causing the increased load of the lesser metatarsal. Surgeons can do this with either a plantar or a dorsal approach. A plantar approach is an excellent option when patients have an acute isolated plantar plate injury secondary to trauma. It allows for direct visualization of the rupture. The drawbacks are over-dissection of the plantar area, potentially painful plantar scarring and a prolonged requirement of non-weightbearing during the healing period. We have found that metatarsal length and hammertoe issues are often concomitant problems that require correction with plantar plate injuries. Therefore, we use a dorsal approach, which provides the option to correct a long second metatarsal and hammertoe deformity in a single incision. Our current dorsal approach also allows for repair of the collateral ligaments without compromising the flexor tendons and plantar fascia. When repairing the plantar plate, it is important first to assess the integrity of the structure and the amount of damage. The majority of our patients usually have an isolated lateral rupture of the plantar plate and possible lateral collateral ligament rupture. Therefore, the senior author prefers doing a unilateral repair. This involves a wedge resection of the damaged lateral plantar plate tissue and subsequent anatomic reattachment of the plantar plate tear and lateral collateral ligament. This approach allows for more tightening of the lateral side and eliminates the disruption of the intact medial plantar plate and corresponding soft tissue. Our current preferred system is the Hat-Trick MTP Joint Repair System (Smith and Nephew) for several reasons. We are able to correct both the plantar plate and collateral ligament structures with this technique. The senior author is also able to perform a unilateral repair by imbricating the torn plantar plate and collateral through a single tunnel with the use of the included polyether ether ketone (PEEK) interference pin in the complete repair kit. I do not use the unilateral kit as I prefer not to use a metal interference pin. The Smith and Nephew tensioning system and fixation also allow one to apply a more controlled tension to the plantar plate and collateral ligaments to correct the toe in both the dorsal/plantar and transverse planes. In the case of patients with complete rupture or greater than a 50 percent plantar plate tear with fraying, a bilateral collateral and plantar plate approach is preferable. It is essential to note that patients with chronic tears tend to have poor, friable tissue quality, which is difficult to repair primarily. If repaired, the tissue would most likely fail under low amounts of tension and correction of the medial or lateral shift of the toe at the level of the MPJ would not be very stable. In these circumstances, I recommend doing a flexor tendon transfer. Split the flexor digitorum longus tendon longitudinally and transfer it to the dorsal aspect of the proximal phalanx. One can also achieve transverse stability by utilizing a small strip of the flexor tendon after dorsally tying it and transferring the strip to the lateral metatarsal head capsule to act as a sling. As primary plantar plate tears are not common and are usually due to associated deformity and biomechanical overload, adjunct procedures are essential to decrease pressure off the lesser metatarsal and prevent re-rupture. A shortening metatarsal osteotomy is often but not always indicated for an elongated metatarsal associated with a plantar plate tear. Shifting the metatarsal head slightly medial or lateral can also simultaneously correct any deviation of the toe. One can perform a distal head osteotomy for a bunion deformity in order to correct pressure distribution. 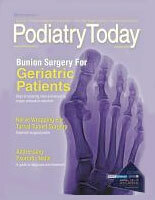 A Lapidus bunionectomy may be necessary if hypermobility is present in association with a hallux valgus deformity. A metatarsocuneiform fusion to stabilize the first ray is also a great option if there is midfoot hypermobility without bunion deformity. An arthrodesis of the proximal interphalangeal joint of the associated toe may also be an option if there is a hammertoe deformity, if one performs a flexor tendon transfer or if the level arm of the toe is still dorsally displaced. This converts the toe into a rigid lever arm, allowing the flexor digitorum longus and flexor digitorum brevis tendons to provide plantarflexory stability at the MPJ and augmenting the intrinsic foot muscles. Lastly, consider a gastrocnemius lengthening to decrease forefoot pressures if there is an equinus deformity present. An Achilles lengthening is rarely necessary. Postoperatively, one of the most common complications is joint stiffness at the MPJ. I emphasize starting active range of motion at five days post-surgery with increased plantarflexion as opposed to dorsiflexion. At two weeks post-op, the patient can initiate both dorsiflexion and plantarflexion range of motion. Being able to do both at this stage is a primary reason that bone fixation and plantar plate repair require adequate stability. We recommend beginning physical therapy at four weeks to increase grip strength and flexor tendon strengthening as well as range of motion. Although metatarsal pain has multiple names, the main triggers are pain, inflammation and instability of the MPJ, which is properly referred to as plantar plate instability. Depending on the severity of the instability, it generally has a sagittal, transverse and sometimes frontal plane component. When approaching a proper treatment option, it is important to focus on the underlying biomechanical source causing the increased load of the lesser metatarsal. Such causes generally include a hypermobile first ray with or without a hallux valgus deformity, elongated second metatarsal, short first metatarsal, equinus deformity or, rarely, acute trauma. Many times, the etiology may be multifactorial and multiple adjunctive procedures are necessary. Current surgical techniques include correction of the hypermobility and hallux valgus deformity, soft tissue release of the metatarsophalangeal joint, metatarsal osteotomy, direct repair of the plantar plate, flexor tendon transfer and arthrodesis of the proximal phalangeal joint of the digit. With proper diagnosis and attention to detail, one can achieve successful outcomes with improved anatomic function and aesthetics. Dr. Redkar is a Fellow at University Foot and Ankle Institute in Los Angeles.